If you’ve been reading North Coast Gardening for any amount of time, you’ve heard me rave about the photography of Saxon Holt. He’s a garden photographer whose work has totally changed how I approach taking pictures, not only of plants and gardens but of other subjects as well. Because according to him, a photograph of a garden is not so much about the literal reality of what we can see in any given space, but more about how we feel when we are actually there in the garden – and he shares tips that help us make that “leap” from what is actually in the viewfinder, to capturing the REAL heart of the garden. Some of my favorite tips from him are here, here, and here. Suddenly it starts to feel like autumn. A few cool nights, with the sun lower and the first leaves beginning to change, fall seems ahead of schedule. Cotinus coggyria ‘Pink Champagne’ shrub in California autumn garden with Muhlenbergia rigens grass. Here in Northern California where the land is drier than almost ever, gardens are looking tired, and I am not expecting a great year for color. 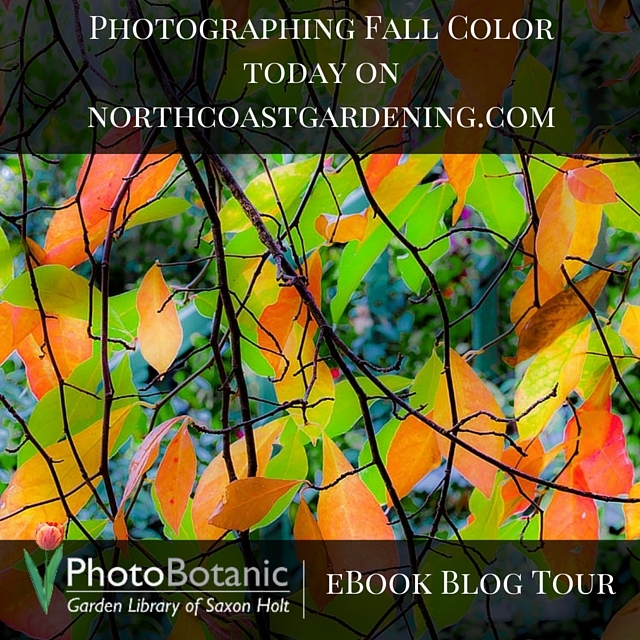 But as a garden photographer my eyes perk up with any sort of change, and in the transitional stages of leaves changing from green to the multi-hues of fall, I find it a wonderful time to be a color photographer. Some of my very favorite photos were taken when the leaves were partly changed, when the brushstrokes of color they represent can be controlled by your camera frame to compose interesting images. Where my back fence stops the deer (mostly) from coming into the garden from the woods, I grow a ‘Roger’s Red’ grape vine. Roger’s Red grape vine leaves autumn show color on a back fence. 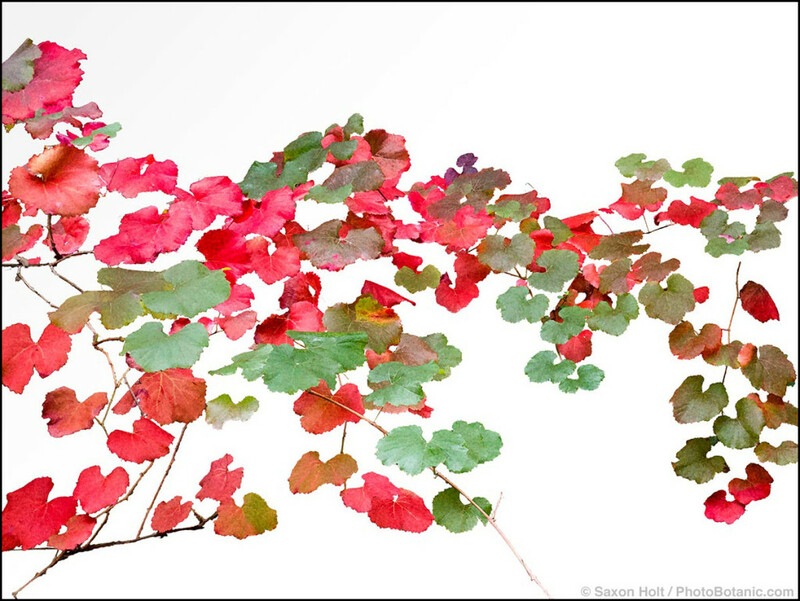 The large colorful leaves are a study of brushstrokes, and arranging a composition in the camera is a sweet study indeed. I don’t know if it is the gardener in me, or the photographer that wants to slow down and commune with the plants in the garden, but I often get lost in looking. Look at fall color patterns and let your eyes lock into a balance of shapes and color. Use the four edges of your camera frame as a canvas and carefully control exactly where you put the shapes – the brushstrokes. Yes, it may take some time to “see” the photograph in front of you; but what else do you want to do with your time ? Tupelo trees (Nyssa sylvatica) are a surprisingly reliable tree for fall color here. Surprising because they are native to wet areas in the East. Mine is very slow to change color and every year I watch for those moments when the blend of colors creates an interesting pattern. 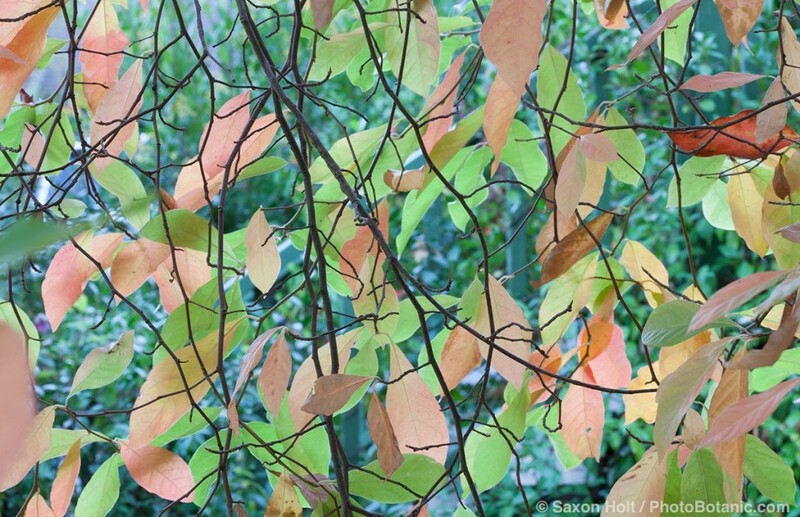 Tapestry of autumn leaves, Tupelo tree – Nyssa sylvatica. A nice trick to getting glowing colors is to use back light. I often talk to photographers about using backlight for working in the bright sun (or Death Star light as Pam Penick calls the Texas sun), but back light works even on overcast days or being in shade looking out to the light. I went under the Tupelo and looked out hoping to find the stained glass effect, where the backlight glows through colors. Surprisingly the red color in the leaves became orange as the backlight worked its magic. The camera saw it somewhat muted, the photographer saw color. 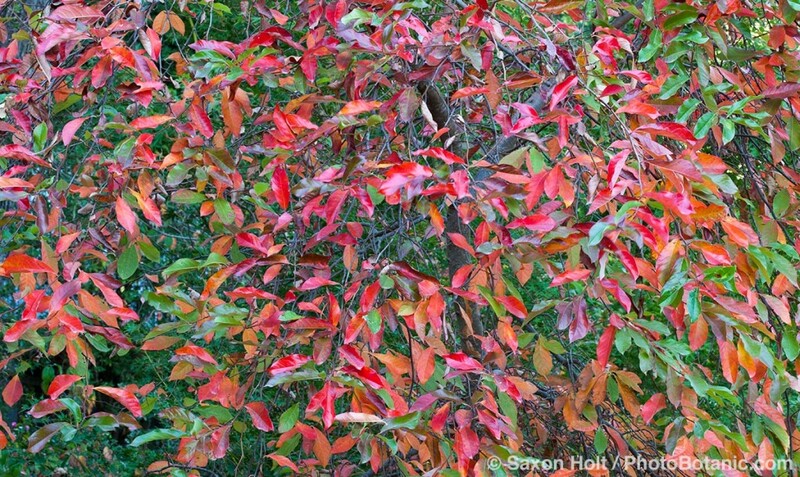 Tapestry of autumn leaves, Tupelo tree – Nyssa sylvatica – with the stunning color showing through. Another autumn is upon us. Every year the color is different and every year something new needs to be studied. Want to learn more about how to think about and photograph your garden? Leave a comment for your chance to win one of TWO copies of Saxon’s eBook, Think like a Camera. I’ll choose two winners at random on September 23. Gardening Gone Wild on September 25 to submit your photo entry. 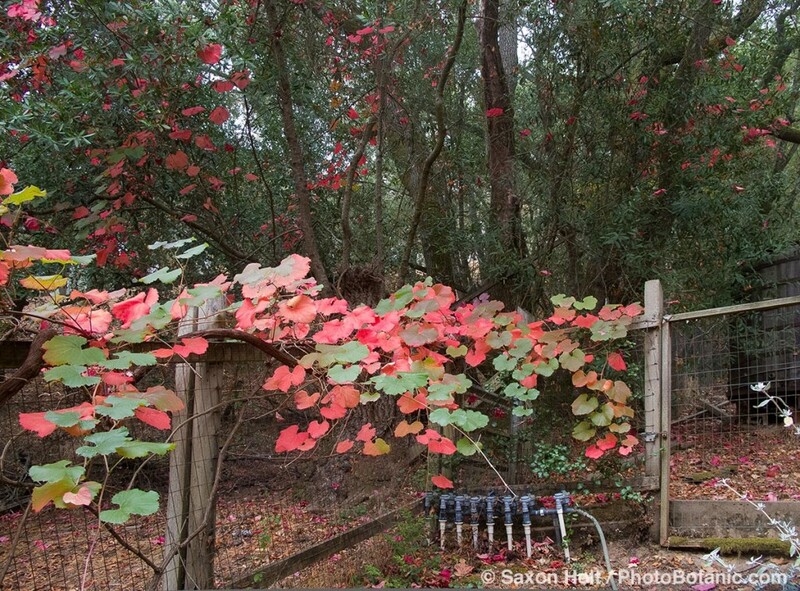 Saxon Holt is a garden photographer and writer in Northern California. His eBooks, online courses, and garden photography tips can be found on www.PhotoBotanic.com, and he also blogs at www.GardeningGoneWild.com. I love noticing changes in the garden…they make perfect pictures especially this time of year….and the idea of backlight even with gray skies is one I had not really considered. Fall is a great time to try it. I received a SLR camera for Mother’s Day that I’m still learning to use (technically). This book looks quite inspiring to keep plugging away at it. This looks great! I am a botanical artist and capturing colors like this would be fantastic! some of our maples turn the most intense red and when the sun is on it they look like they are on fire. It’s already starting to feel like fall, so the timing couldn’t be better for this information! I always find fall color tricky. Thanks for the lesson. Thanks for hosting Gen. and wow, thanks for the kind words. It is always nice to know someone actually uses those tips and sees improvement in their photography. I always forget the backlight point of view, as if I must photograph only the front. Gorgeous! Would love to explore using a camera to enhance how I see my garden! the photo from inside the tupilo tree was on my screen when i glanced at it. i took it to be an abstract, only later did i look more closely and kmow it was fall color. Following Saxons tips, tricks, & hints has improved my vision through my camera to “see” what I really want to photograph. Thanks, those are great tips. Now I can’t wait for some Fall color to photograph! This makes me excited for Autumn – and gosh I hope I win this wonderful book so I can photograph its best side! I’m eying my Spicebush and Cardinal Dogwood! This is such a wonderful giveaway and also the chance for me to visit blogs I have not visited before. I don’t know which I enjoy more – the wonderful photography tips or meeting new blogs. Thank you. Gen! Thank you for hosting! (I kept coming over to visit yesterday, but I didn’t leave a comment.) This is a good one, as I find fall color tricky. What a lovely post. Who doesn’t love fall color. Here in SW Pennsylvania we still have a few week before we hit prime color and I’m hoping to get some good pics. Thanks for the tips!! 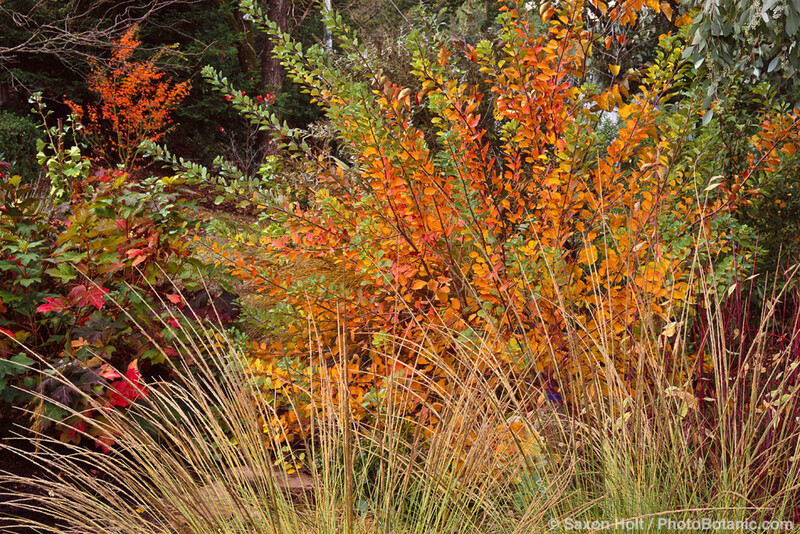 Gosh, great photos of native gardens – wonderful to see! Saxon is excellent. What a treasure and thanks for sharing. I see things most people don’t. Quirky artistic brain. Would love to have another person’s visions and expertise. I am new at photography.. Learning to see in the moment, to capture what I see and how it can be different to all of us…this is what is so exciting..thank you for showing us the beauty from your eyes. 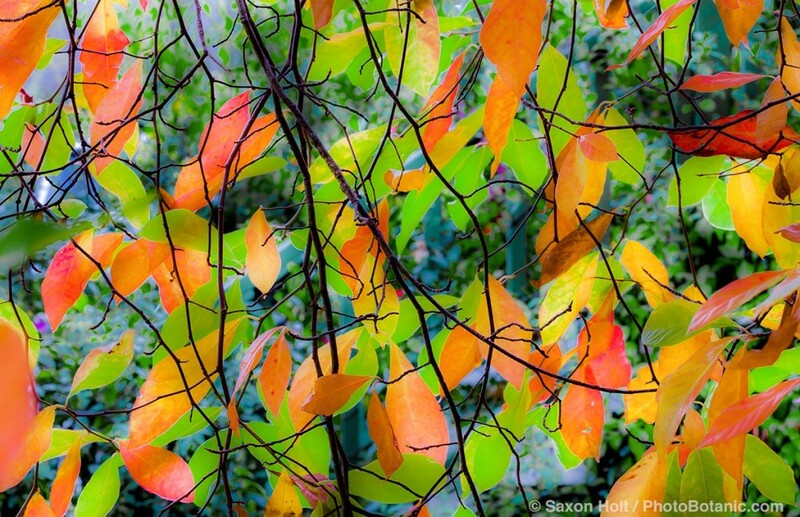 Saxon Holt’s photography has inspired us through so many of the books he brought to life. ‘Grasses’ is a favorite! I’ve heard that early morning is the ‘best’ time to take photos of a garden. But I have found any time can be good providing you are in that creative frame of mind – then you ‘see’ great shots everywhere. What is more romantic than photography & gardening! Besides you are cultivating my brains! I am always looking for ways to improve my photography, so this book would be great! Gorgeous! The trick here seems to be to think like an artist! Love the idea of backlighting! I’m inspired!! Never thought of shooting the backside of leaves for a completely different perspective. Thanks for sharing this author’s work. I’m quick to take close-up photos in the garden but I really need to bone up on my skills and remember to get great wider-aspect-ratio photos as well. Looks like a lovely book. Inspiring. I love autumn and this motivates me to try some mood photography. Nothing better than a foggy morning to make fall yellows, oranges, and reds really pop. Autumn is my Favorite time to slow down from the heat of the summer and let the rains take over my watering chores. More time now to enjoy the scenery! 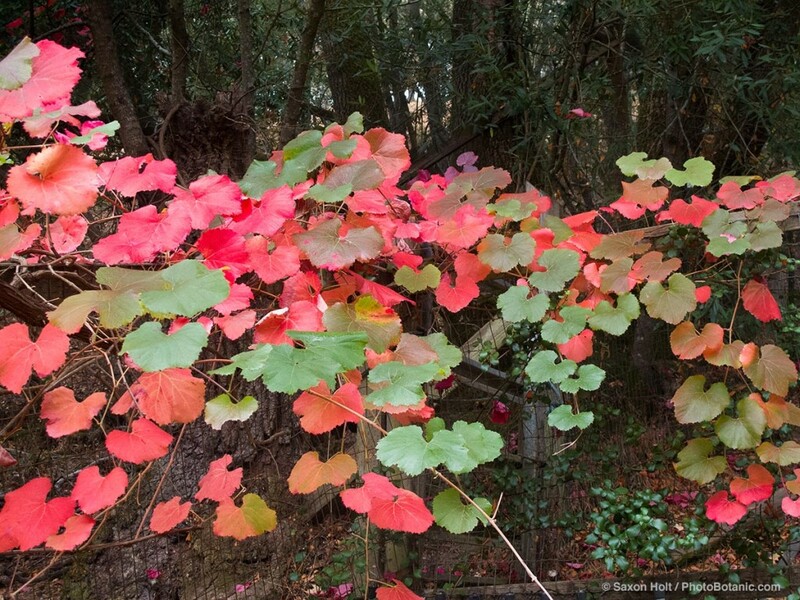 I do especially love my Cotinus coggyria ~ Smoke Bush for both the spring purplish leaves and my Smoke Tree Cotinus obovata for the orange and yellow fall leaf colors. They are such carefree Beautiful garden additions. I love capturing the moment on my digital camera and I would relish a chance to gain some new perspective from your interesting sounding book ? Autumn my favorite season, love gardening and love taking pictures of nature. Thank you for sharing these great ideas. Your pics look beautiful and inspirational. Beautiful! We know autumn is probably the best season to take photos of gardens and inspiration emanating from the images is so important for us when projecting our landscapes. Thanks for that!